For the first time since Paul Vallas was "Chief Executive Officer" of Chicago's Public Schools, CPS officials are refusing to provide this reporter and other Substance reporters with copies of the printed "briefing books" that are the scripts for the hearings being held on the proposed closings, turnaround, phase outs, co-locations and turnarounds. In once instance, the refusal of CPS officials to make public the public information from which they testified has slowed down the ability of Substance to report on the hearings, especially those involving Guggenheim Elementary School, which is slated for closing because it is supposedly "failing" according to the complex formulas utilized by CPS to determine such things this year. The last hearing on Guggenheim took place at CPS on January 26, 2012. Above, CPS "Chief of Schools" Adrian Willis (with glasses and shaved head) read from a prepared script that was in the briefing book being thumbed by CPS Law Department Attorney Susan O'Keefe during Willis's testimony. CPS officials refused to provide Substance with a copy of the briefing book at the end of the Guggenheim hearing, even after Substance told O'Keefe that it was necessary so that Substance could accurately quote Willis and others. Willis's controversial claims (viz., that the teachers had undermined the school despite much support from his office) were contradicted by teachers and parents, who spoke of centrally created sabotage and a kind of "musical chairs" of principals. 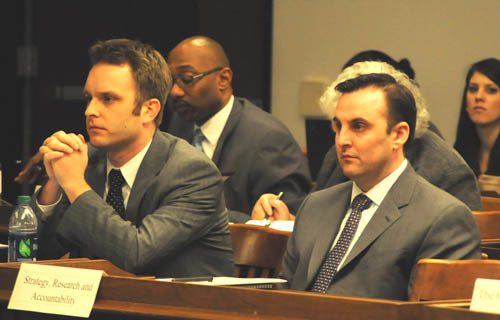 Substance photo by George N. Schmidt.Earlier in the month, Chicago Board of Education members and the top officials of the current CPS administration had claimed that they would attend all the hearings. Top officials of CPS (including Chief Executive Officer Jean-Claude Brizard and Chief Education Officer Noemi Donoso) and the seven members of the Chicago Board of Education were not present at the hearings on January 26. Following the hearings on the proposed co-location of Chi Arts and Doolittle East and later the same evening after the hearing on the proposed closing of Guggenheim Elementary, CPS officials, including officials of the Law Department and the Office of Communications, took it upon themselves to refuse to provide Substance with those public documents, despite the fact that the documents were in the Board chambers at the time the hearings ended and could easily have been provided (as they have been in the past). As of a result of this new anti-transparency policy of the Brizard administration, Substance has delayed some reporting on the most recent hearings, and also filed the following request under the Illinois Freedom of Information Act. Because of the explosive content of some of the remarks being made by CPS officials, Substance has tried to get the briefing books to be able to quote them verbatim. The refusal of CPS to provide the books (which the officials read from, as scripts for their testimony) makes completely accurate reporting difficult. For example, when asked by Substance for a copy of the briefing books at the time of the Chi-Arts/Doolittle hearing, Frank Sheftan of the CPS Office of Communications said with a smile: "It ain't gonna happen tonight." When asked for a copy of the briefing book following the Guggenheim hearing the same night, CPS attorney Susan O'Keefe refused, despite the fact that a number of additional copies of the book were in the Board chambers, having been compiled by the CPS Law Department where O'Keefe works (she said, in "litigation"). 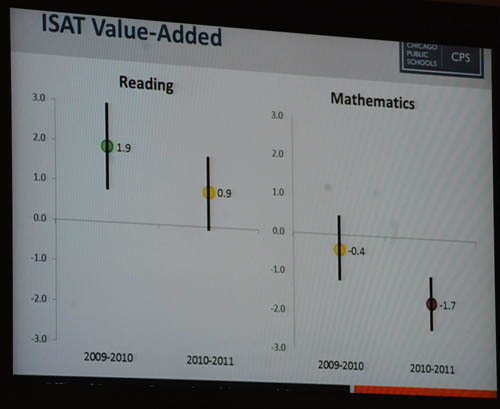 A melodramatic Power Point slide showing the drop off in ISAT scores at Guggenheim supposedly proved that Adrian Willis's claim that the teachers had failed was consistent with the facts. Teachers and parents later testified that the school had effectively been sabotaged by CPS following its successful thwarting of a previous attempt to close the school (under then CEO Ron Huberman, in February 2010). 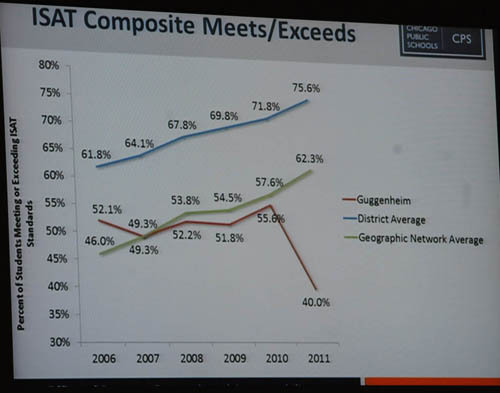 A statistical anamoly such as the one depicted above raises questions about the content that gives rise to such dramatic changes in data trends (note that prior to 2010 - 2011, Guggenheim's scores were increasing at roughly the same pace as both the "Geographic Network Average" and the "District Average" before the sudden drop off. Because Guggenheim's defenders are unable to cross examine the witnesses against the school, the Power Point becomes a substitute for the truth. Substance photo by George N. Schmidt.One of the reports that will be elaborated when Substance gets the complete books is the testimony of Adrian Willis, Chief of Schools for the "Network" that contains Guggenheim. According to Willis's testimony, which was contained on the script in the book, the reason for the precipitous and dramatic drop in test scores at Guggenheim (as depicted in a Power Point he presented) was that teachers at the school had resisted new methods of instruction which would have brought the school better resulted. Subsequent testimony by the teachers, however, showed that Willis's office had allowed the school to be effectively sabotaged by failing to provide the school with enough books, by forcing large class sizes, and by instituting, through a principal who was only at the school for one year, a discipline policy which allowed the most undisciplined children to get away with misconduct — while blaming the teachers for the problems. According to several teachers and parents who testified, the disruptions caused by the principal (who has since left the school) was a major reason for the dramatic drop in test scores. This is a request for the hearing briefing books for all of the hearings held last week and to be held this week at CPS on the current round of closings, consolidations, co-locations, phase outs and turnarounds. As you know, on each of the hearings currently scheduled or having been held at CPS (fifth floor, Board chambers) a briefing book is prepared and utilized by the hearing officer and CPS officials during the hearing. Our reporters from Substance covered the hearings that began at 125 S. Clark St. last week, and I personally covered the hearings held on January 26, 2012 regarding the co-location of "Chi Arts" and Doolittle East (5:30 p.m. that day) and the proposed closing of Guggenheim Elementary School (8:00 p.m.). 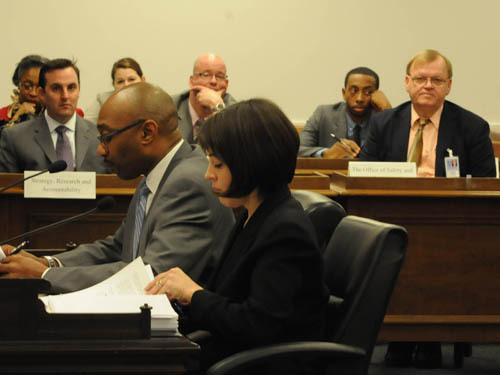 During past years, I was able to leave each hearing with a copy of that book, provided by CPS Law Department or other CPS officials. During the current round of hearings, CPS officials (Frank Sheftan, Communications; various lawyers from CPS Law) refused to provide me with a copy of the briefing book at the close of each of the hearings. On January 26, both Mr. Sheftan and one of the lawyers present refused to provide a copy of the book, despite the fact that at each hearing they had a box of them in the room. Apparently, Mr. Brizard, Mr. Rocks, or Mr Cawley has ordered CPS officials and attorneys present during the hearings to refuse to allow us to get these documents at the end of each of the hearings (I cannot believe that lower ranking officials such as Mr. Sheftan can make such important decisions of their own volition). This childishness hinders our ability to report with complete accuracy the content of each of the hearings, which in many cases we are the only reporters to cover. For example, I have held off reporting on what amounted to an enormous bit of mendacious teacher bashing by Adrian Willis, Chief of Schools, during the Guggenheim hearing because I want to quote exactly and precisely from the script that he was reading from before I report his words. They are part of the record, but as of this writing, that record is being denied to Substance. As you know, we have recently taken, again, to cooperating with our colleagues in other media organizations in Chicago to provide more accurate information and analysis of CPS activities, and we are informing them of the lack of transparency in this instance. Since those books are prepared and in the possession of the Law Department, where you work, it should pose no problem for those books to be brought for me for pick up at the Law Department. Law Department officials know all of the hearings which have been scheduled and held. One of the most interesting facts that i have learned over the years reporting on CPS corruption is the idea that a government agency as large as CPS acts with impunity towards to the law and the civil rights of the children of Chicago. What is needed is a paper pusher who is willing to stop the lawlessness that is the Chicago Board of Education. Our students are not the criminals, they are innocent. The criminals are CPS and what they are doing to communities and children. There must be an investigation, like the one currently being done in Wisconsin of Walker's staff,of the legality of closing schools against the wishes of the communities involved. CPS is involved in criminal activity by putting our students at risk, destabilizing communities and students lives using lies and half truths. There has got to be a stop to this criminal activity. I was a social studies teacher in Washington DC for four years. Many of my classes were classified as inclusion with 30 or more students, with as many as 17 having special education links. Chancellor Rhee visited one on my classes in January 2009, that had listed 37 students, she nor any of her team showed any interest in the students benifiting from consistent implementation of supports, lack of co-teacher nor classroom paraprofessionals.